Peter Rabbit greets visitors and poses for photographs (both days) during Peek-a-Bloom with Peter Rabbit. Concert on Bloemendaal Lawn (Saturday only; 2-3 p.m.) Easter Brunch in the Robins Tea House by reservation SOLD OUT (Sunday). Also, enjoy A Million Blooms! 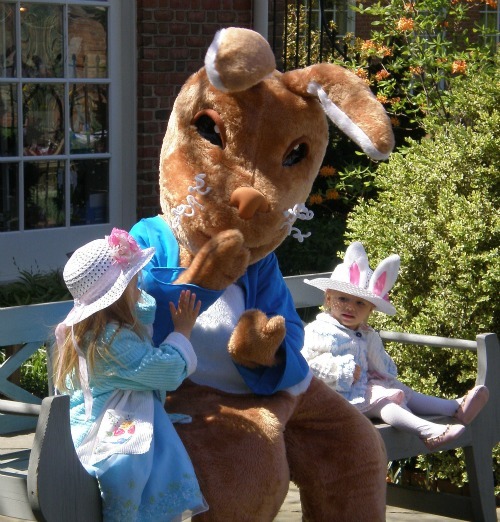 Come to meet Peter Rabbit as he poses for photographs in the Children’s Garden on Saturday and Sunday from 1 p.m.-4 p.m.
Join us for activities in the Children’s Garden, including drawing with sidewalk chalk, hula hooping, and making garden hats out of materials such as bags and ribbons. Families can also borrow a basket from our Story Tree — inside the basket is a book, a blanket to spread out on and an activity related to the book. Food is available for purchase in the Garden Cafe. Hop by the Garden Shop to see the latest spring merchandise! Saturday only; 2 – 3 p.m. Concert on the Bloemendaal Lawn. This year’s theme is “Music on the Bloemendaal Lawn” and is a musical trip to gardens and parks in the Richmond area and beyond. Sunday only: Price-Fixe Easter Brunch in the Lora Robins Tea House SOLD OUT (Seatings at 10 a.m., 12 p.m., and 2 p.m.) Tickets go on sale February 1 annually. Reservations: teahouseevents.com NO phone reservations, please. A parade of blooms unfurls as the weather warms: daffodils, tulips, peonies, roses and many more! Experience the wonderful world of butterflies! Tropical beauties– fascinating and showy– transform the Conservatory’s North Wing into a wonderland of vibrant colors.